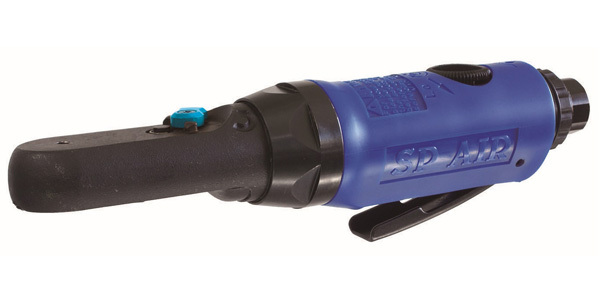 SP Air Tools introduces their new SP 7250H Low Profile Hex Bit Driver. The SP-7250H is lightweight and features a patented sealed head with low profile for use in tight areas. It features a one-hand, easy-to-use thumb level for forward and reverse operation and an air control so you can control the speed. It also features a 360-degree rear exhaust. Overall length is only 8 inches, it weighs only 1.5 lbs., it has a 1/4-inch hex drive, and it only uses only 2.5 CFM. It has a free speed of 290 rpm and a maximum of 25 ft. lbss of torque, and can also be used with hex drill bits and all 1/4-in. drive bits. SP Air Tools are all made in Japan of the highest grade materials and steel for quality gears and bearings. For more information, visit sptoolsinc.com.